The book is the first systematic exploration of a series of phonological phenomena previously thought to be unified under the rubric of syllable weight. Drawing on a typological survey of 400 languages, it is shown that the traditional conception that languages are internally consistent in their weight criteria across weight-based processes is not corroborated by the cross-linguistic survey. Rather than being consistent across phenomena within individual languages, weight turns out to be sensitive to the particular processes involved such that different phenomena display different distributions in weight criteria. The book goes on to explore the motivations behind the process-specific nature of weight, showing that phonetic factors explain much of the variation in weight criteria between phenomena and also the variation in criteria between languages for a single process. The book is unlike other studies in combining an extensive typological survey with detailed phonetic analysis of many languages. The finding that the widely studied phenomenon of syllable weight is not a unified phenomenon, contrary to the established view, is a significant result for the field of theoretical phonology. 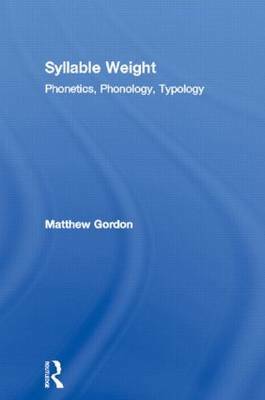 The book is also an important contribution to the field of phonetically-driven phonology, since it establishes a close link between the phonology of weight and various quantitative phonetic parameters.